This map shows territory of Kazakhstan. actual map of Burunday for Garmin. map of Pervomayskiy calibrated this. detailed map of Zhanadaur free download. interesting map of Yesentay with gps calibration presented. interesting map of Bereke и OziExplorer calibration for gps. actual map of Shilikemer 1 cm to 1 km for you. 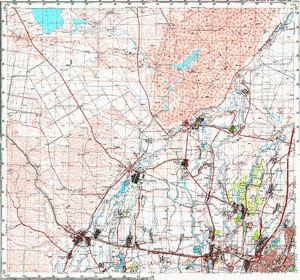 map of Koyankoz 1 cm to 1 km download for free. interesting map of Mezhdurechenskoye 1 cm to 1 km displayed. interesting map of Kol'ashchi calibrated free download. free map of Kokozek download for free. topographic map of Tsentral'nyy Ispolnitel'nyy Komitet Kazakhskoy Sovetskoy Sotsialisticheskoy Respubliky 1 cm to 1 km download for free. map of Kauchuk 1 cm to 1 km presented. interesting map of Karaoy with gps calibration this. map of Lenino for gps. map of Chapayevo with gps calibration download for free. map of Dzhaugash download for free. actual map of Zharmukhambet free download.